I am happy to share a bit more information about the work-in-progress that is Wrimuse Studio. Put succinctly, it is a desktop app that lets you generate, write, save and export writing exercises. It all comes back to the name and goal of being a writer’s muse. Wrimuse Studio will be for Windows in its first release. It is currently in alpha testing, while the algorithms are being tweaked, more data is added, and a few non-prompt generators are included as well. 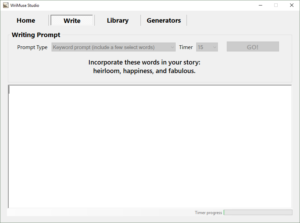 At the time of writing, Wrimuse Studio is fully capable of generating 4 different types of writing prompt: the “full prompt” presents you with a character perfoming an action in a specific location, and asks that you build on that setup. 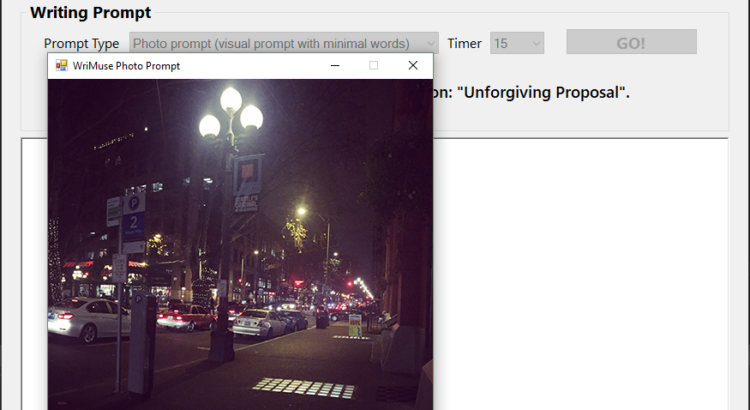 The “keyword” prompt gives you 3 keywords, that should be the focus for your writing, the “photo prompt” shows a photograph with a 2-word caption, and finally, the “essay prompt” suggests a debatable topic to write about. Besides the writing prompts, the character generator is also working, and can help inspire or challenge your writing by adding a new character for your story.